Is Big Pharma fueling the ADHD epidemic? Alan Schwarz talks about his book, ADHD Nation: Children, Doctors, Big Pharma, and the Making of an American Epidemic. Then, maybe ADHD isn’t so much a disorder, as a different type of brain — one with great gifts, as well as deficits. 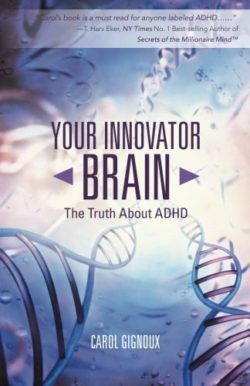 Carol Gignoux discusses her book, Your Innovator Brain: The Truth About ADHD. ADHD is an epidemic. Nationwide, 15% of kids are diagnosed with the disorder — and in some regions of the country it runs as high as 30%. But is the disorder an epidemic — or its diagnosis? And what’s fueling it? The ads claim your kid will get all A’s — and take out the garbage to boot — if you just give him or her a pill like Adderall. But what if your kid’s problems aren’t due to ADHD, but to anxiety or maybe just too much teaching to high stakes tests? And what about those kids who take the drugs to get ahead and end up getting addicted, instead? 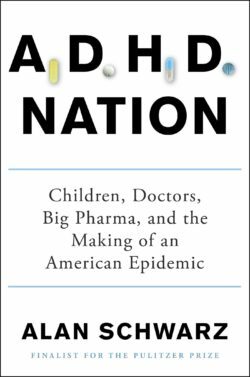 In his new book ADHD Nation, New York Times journalist Alan Schwarz says the pharmaceutical industry’s relentless drive for profit is putting millions of kids at risk by pushing the ADHD diagnosis onto an anxious public. It’s the “ADHD industrial complex,” he says: an unholy alliance between Big Pharma, researchers and government agencies promoting powerful drugs that have the potential for abuse. Alan Schwarz is a Pulitzer Prize nominated national correspondent at the New York Times. He’s best known for his ground-breaking coverage of the seriousness of concussions among football players. In addition to ADHD Nation, he’s the author of two books about baseball. As someone who both has ADHD and is the parent of someone who has it, Francesca knows the condition is real. But she also knows that it brings great gifts along with its deficits: like creativity, insatiable curiosity and a kind of big picture thinking that comes up with creative solutions to problems. These are the pluses that compensate for the minuses of disorganization, distractibility and forgetting appointments. So she was intrigued by the title of Carol Gignoux’s book, Your Innovator Brain: The Truth About ADHD. Here finally was a book that celebrated the strengths of her kind of brain, while acknowledging its weaknesses and giving suggestions about how to compensate for them. Carol Gignoux knows whereof she speaks. She has an “innovator brain,” in her parlance, and has been coaching people with ADHD for 40 years. Learn more about her ADHD coaching here.